On a warm Tuesday morning cups of hot tea and milk are passed out to nearly 100 clients sitting outside of an office at Mulago hospital, the largest hospital in Uganda’s capital city. A hospital employee in a dark blue jumpsuit speaks to the crowd in Luganda, the local language. The office belongs to The AIDS Support Organization (TASO), which was founded in 1987 as the first organization in Uganda dedicated to supporting those living with HIV. It provides HIV testing, treatment and counseling services to HIV-positive people. In 2010 current TASO employee Fred Ssenga had a cough that would not go away. He said he was afraid and had to force himself to go get tested at Mulago. His wife had been pregnant and their child had died. His results showed he was HIV-positive. He was referred to TASO for antiretroviral drugs (ARVs) and counseling services. Next, he had to convince his wife she had to be tested as well. Unfortunately, she died two years later of AIDS and Ssenga was left to care for their now eight-year-old daughter alone. Ssenga’s story is unique in that the man tested first and then had to convince his wife. Far more often in Uganda, the women test first and then struggle to get their partners into a clinic. These days, Ssenga works three days a week for TASO as a clinical service provider. He also talks to HIV-positive clients, reassuring them that they can live with HIV. “I tell them don’t fear to be tested for HIV cause when you are tested you will get to know your status and getting to know your status, you will be treated and you will be okay” Ssenga said. Like the United States, Uganda first recorded cases of HIV in the 1980s. Ugandans initially called the disease SLIM, because people who had it became very thin. Uganda made dramatic progress in the 1990s to reduce the spread of HIV. The president of Uganda, President Yoweri Museveni encouraged people to be tested and insisted on a multi-sectoral response to fight the epidemic because it affected everyone in the country. The current prevalence rate in Uganda is 7.1 percent according to UNAIDS. Eighty-three percent of women have been tested for HIV and received their results compared to 70 percent of men, according to the Uganda Demographic and Health Survey 2016. The UNAIDS Commission has set an overall goal of 90-90-90, meaning 90 percent of people are aware of their status, 90 percent of those who have HIV receiving treatment and 90 percent of those on treatment virally suppressed. Recently President Museveni emphasized the importance of increasing testing rates for men. The United States is the single biggest monetary contributor to reducing HIV in the Uganda. According to its website, the President’s Emergency Plan for AIDS Relief (PEPFAR), provided $371 million U.S dollars to Uganda in 2016. PEPFAR was initiated by President Bush in 2003 in response to the worldwide AIDS epidemic. It focuses on African with high prevalence rates. The U.S Embassy works with the government of Uganda strategically use PEPFAR funding to encourage more men to test for HIV. In an email sent June 8, 2017 U.S Embassy spokesman Christopher J. Brown said all PEPFAR’s implementing partners have been given male targets for testing and to initiate and retain treatment. Despite the government’s continued emphasis on the importance of male involvement in the fight against HIV, some in the healthcare sector feel it still has not done enough to get men tested. Sarah Tumewebaze, the Media and Communications Officer for The Uganda Network of AIDS Service Organizations (UNASO), said the government needs to create more public awareness of their policies if they want them to be effective. Currently the prevalence rate is around 8.2 percent for women and 6.1 percent for men. This may contribute to the myth that HIV is a woman’s disease in Uganda. Tumwebaze said one reason for the different rates is the fact that men often have multiple partners and infect multiple women. She said the government needs to focus on reaching boys through education about HIV related issues. Don Abel* looks like any other 22-year-old man, and he is. He works, volunteers and enjoys spending time with his friends. He is also HIV-positive. Abel belongs to the Friends Forum, a group organized through Reach Out Mbuya Parish (ROM), a community faith-based NGO funded by the Catholic Church that provides HIV related services. The Friends Forum provides a space for young people living with HIV to spend time together, playing games, having discussions and creating new friendships. Abel was diagnosed with HIV when he was 11 years old. After his father died, his mother took him to ROM to test for HIV. He said he shed tears when he was told he was positive. Abel is interning as a counselor at ROM. He also volunteers, often as a peer supporter. He said clients assume that the doctors and clinicians who speak with them are not positive and they cannot relate to them directly. They need peer supporters to provide morale boosting. He said the friends he made through Friends Forum helped him handle his self-stigma and pursue his ambitions. Abel said he knows many other men have self-stigma when they are diagnosed with HIV and he believes their desire to be seen as strong prevents them from going to be tested. “They fear their position as men,” Abel said. Richard** was only 17 when he was diagnosed with HIV in 1990. He became sick and when medicine didn’t help, he said he thought he might have the disease called SLIM. He struggled at first, worrying whether he would live long or die of AIDS. But the counseling services and friendships he found at TASO helped him deal with his fear. He said he made the decision to live positively. He is now the national coordinator of the Positive Men’s Union (POMU), a group for HIV-positive men living in Uganda. Back in 1993, he was part of a support group for men at TASO. They had only eight members, and Richard said he had the idea to create an organization for men with HIV. “We knew that the women who were visiting TASO had partners but these partners were home maybe with stigma or not knowing where to go for testing or HIV services,” he said. Group members endorsed Richard as chairman. Today, POMU focuses on community mobilization and education. They work with schools, local councils and institutions to talk with workers, students, and community members about HIV. Since the members of POMU are all HIV-positive, they are able to share their personal experiences about living with HIV. He said they encourage others by telling them that even if they test positive for HIV today, they can continue living for a long time. Richard said he believes community stigma is not as present as it once was because of how many people have been affected by HIV. “It is hard to find a family that has not lost a friend or family member,” he said. But he said he thinks self-stigma is still very high, and this may prevent men from going in to test for HIV. He said one of the largest problems is donors and the government think people know enough about HIV, and therefore put less money into the production of education and communication materials. He said many people lack basic knowledge about HIV, like how it is transmitted. “You find that four out of 10 will give you the right answer,” he said. Richard said the establishment of male action groups is a good strategy to increase HIV testing rates for men. “Influential and powerful men are mobilized into a group and trained and then facilitated to reach out to other men,” he said. Recently, POMU was part of a Men Engage Uganda project called “Increasing Male Participation in the 90-90-90 Targets,” that held HIV training activities for men in Eastern Uganda. The main objectives of the program were to increase participant’s knowledge of HIV, update them on UNAIDS 90-90-90 target and the test and treat policy and to increase the number of men using HCT (HIV counseling and testing). By the end of the activity, they managed to provide HCT to 834 boys and men in rural areas. Despite this recent success, Richard said the delay of implementing the National AIDS Trust Fund is frustrating. POMU has more than 6000 members but Richard feels it’s not enough. Due to lack of funding, it is difficult to make sure HIV testing facilities have information about POMU to distribute to men. But he said POMU will continue to work towards reaching every man affected by HIV in Uganda. “We are not seated, and that is part of our advocacy,” he said. Ssenga stands in a dimly lit reception room on a sunny Tuesday morning. He is at Grace Medical Centre, the health clinic he opened in last year in Entebbe, a town about 45 minutes north of Kampala. The walls are lined with shelves filled with boxes of various medical supplies and drugs, from painkillers to malaria testing kits. Today the clinic is quiet. It is empty except for Ssenga and the only other employee, a nurse named Grace. 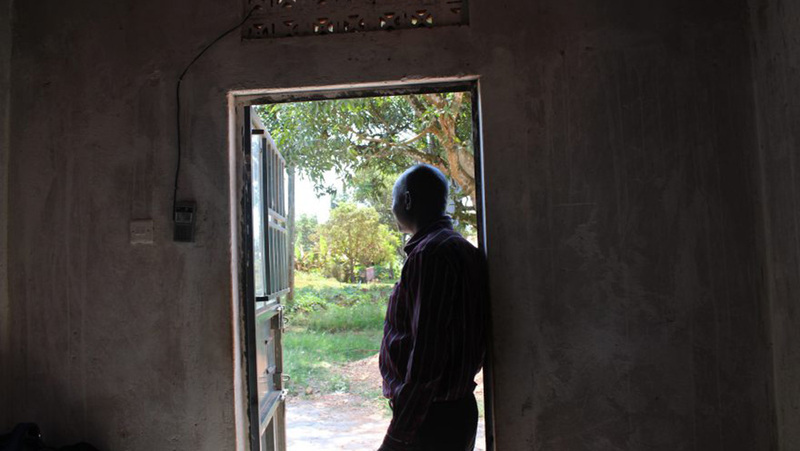 Fred Ssenga stands in the doorway of the clinic he opened last year. He wanted a way to make extra money while helping people in the community. In Uganda, Ssenga’s background as a clinical service provider allowed him to open the clinic. He wanted to help the people living in the area because there are few clinics nearby to serve the fisher folk who live in the community. This time of year business is low. During the rainy season, the months of July, August and September the clinic sees almost 10 times more patients. Ssenga himself supplies all the drugs at the clinic with his own money. Many of his patients cannot afford to pay. “Here they are village people, they don’t have money so if you charge them you find that most of them they don’t have that money,” he said. Ssenga allows them to sign a book he keeps in his office that says what they owe so they can return to pay when they can. “People take long to bring their money, some they don’t even bring the money,” he said. Ssenga takes a taxi bus and a boda boda (-a motorbike taxi service), to commute to the clinic on days when he is not working TASO. In the future he hopes to have enough money to be able to expand. Ssenga said the counseling he received after his diagnosis helped him deal with being HIV-positive. Working at his clinic gives him an opportunity to give back in a similar way. * Don Abel is not his real name. His identity is being concealed so he can avoid discrimination and harassment. ** Richard requested that only his first name be used to avoid discrimination and harassment.